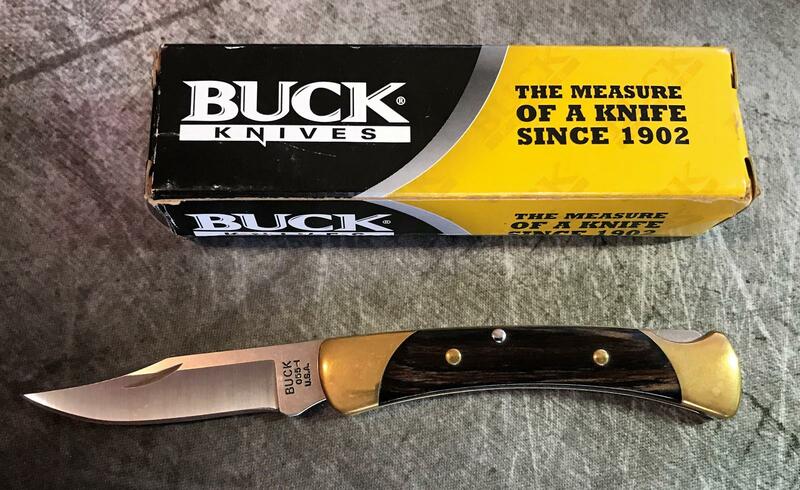 Discussion in 'Buck Knives For Sale' started by Fixall, Apr 16, 2019. Today I have a Buck 55 for sale! I am the second owner of this knife, but the blade has never been used. In fact, it's never even been carried... Just kind of admired at my desk, lol. The bolsters have a nice patina (good old Washington state) but the blade is in perfect condition. I really, really like the pattern/color of the scales on this specimen, they have so much depth and warmth! I love this knife and the only reason I'm selling it is because I just purchased the "Buck of the Month" version of the 55 and I can't justify keeping this. The fit and finish is fantastic as is the centering. In fact, I think this knife has the best fit and finish of all the Bucks I own. It's a sweet knife. Comes with the knife, box and paperwork. I accept PayPal G&S (I pay the fees) and ship everything either First Class or Priority (depending on the speed) through the USPS and provide tracking. I am asking $35 Shipped SOLD! for the Buck 55. *Further trader feedback at Heatware.com under the same forum name.